Delight your little one with their very own stool on which to sit; every child loves having one. The seat teaches children about perception, problem solving and patience. It’s also great for improving a child’s hand to eye coordination with the puzzle pieces. Name can be 8 letters and must be first name only. 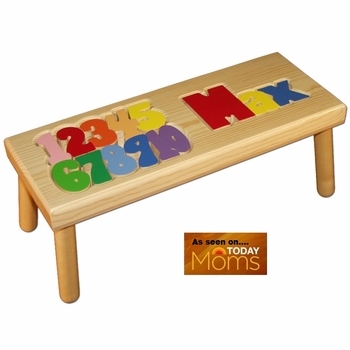 Made from quality solid wood, the stool stands nine inches tall and the top measures 9 by 24 inches. For an even more elegant touch you can us engrave a heartfelt personal message or birth information on the bottom of the stool. Please accept my sincerest "thanks" for the precious letter/name stool I recently ordered for my friend's first grandchild due in March. I received it today, and the quality of the wood, painting, and construction was absolutely beyond anything I expected. I will refer your company to everyone I know. Thank you so very much!